Last 5 years solved question papers of ALP RRB Kolkata? ALP previous years question papers? Previous 5 year solved Question Papers for RRB Section Engineer Exam? RRB solved previous years question papers for section engineer? Books to be referred for ALP entrance exam? Previous years question papers? Re: RRB ALP solved previous years question papers? 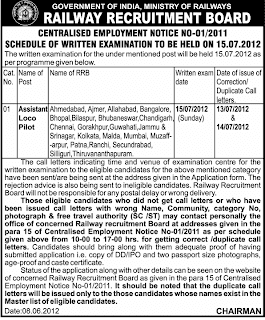 Those candidate have completed ITI or Diploma or B-TECH degree with some special department are eligible for Loco Pilot exam.Some selective department are applicable for this exam . In The RRB Assistant loco pilot Examination, Questions will be asked from Technical, Non Technical, General English, General Awareness, Arithmetic's, Reasoning etc. I have attached the Syllabus and Question papers of for Assistant Loco Pilot examination so please check it out. I completed my B.Tech With Information Technology Background Am I Eligible to Write Assistant Loco Pilot Exam ?